Beautiful!! LOVING the colors, the houndstooth and that sentiment!!!! Very clever Thank You card. Love how you used your buttons. Look forward to your process photos. oooo Very fun and clever. Love it. Super cute card! I am loving that houndstooth banner! Really cute, love the sentiment! This is so cute. Love that saying and the colors you choose. very cute~someone will love getting this!! I love the card. The basket of allies is perfect for Fall. This is SO cute -- what a timely idea for a thank-you card! Loving the clustered embellishments! So adorable! Love the patterns, the colors and the sentiment! Fabulous job! Always love your cards, Lisa! This is beautiful! So nice! Love the patterns you combined! You are just rocking that line! Love it! So cute Lisa! Love the sentiment to go along with the chipboard pieces! 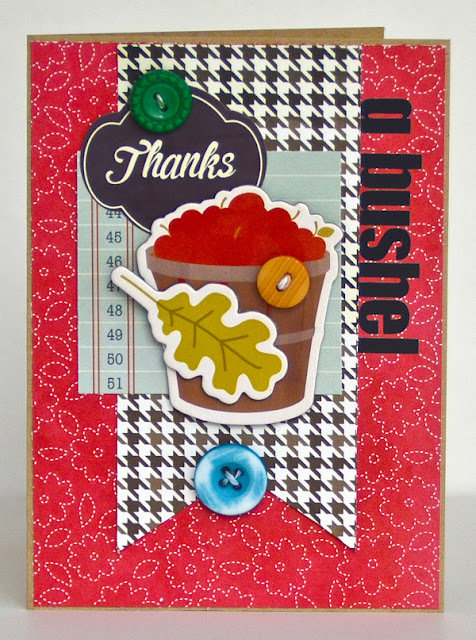 Lisa, I love this card and how you accented the saying with that adorable bucket. thanks for linking up to Crafty Creations. So appreciated and I love seeing your work.